Well, nothing much has happened since I last wrote. The weather has been very hot, and we had a big thunderstorm yesterday afternoon. Fr. Bennett is still away. Fr. Bourke (the Provincial) arrived today to stay the weekend. Wish Kitch a “Happy Birthday” for me. Sorry I can’t write! We have another Latin Sung Mass tomorrow under the competent hand of the Highden Singing Master. Last Sunday’s went very well. Last Tuesday we had a Conge. We had very good weather. We had to walk eight miles there and 8 miles back. When we got there, there was only a very muddy creek. However, we were that hot that we all sat in it. I suppose Leo will be going to school again soon. We will miss the visits from travelling teaching priests once school starts again. You don’t see many faces during novitiate so we are always pleased to see visiting fathers. How is Mrs. Clifford these days? You don’t get newspapers, radio or T.V. here so I haven’t got a clue as to what is happening in the “outside” world at the moment. As you can see, I’m struggling for news. 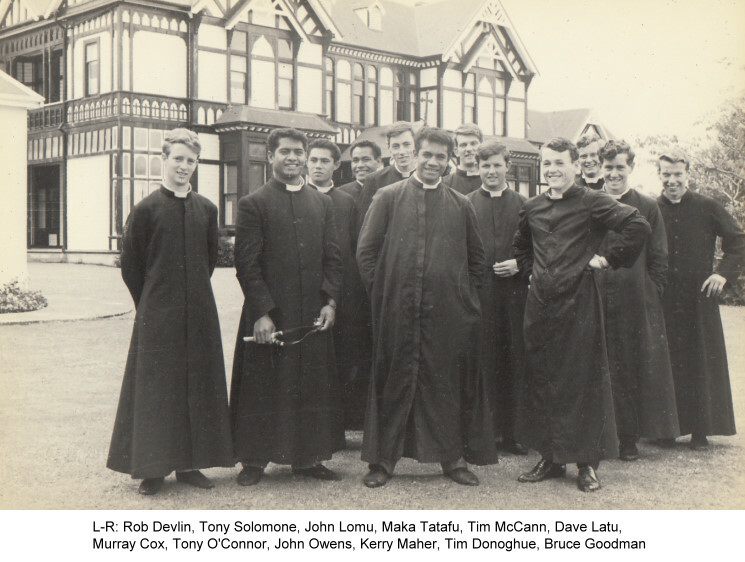 Nothing much changes here from day to day (except for the Liturgy!) At the moment everyone is quite sick of “pious” books, and are a bit depressed, but I suppose we will grow out of it soon. Dan O’Leary, a 5th/6th year student at the Mount & prefect at Silverstream in my 3rd form left recently. However, I suppose he is a bit upset because his brother was killed in an accident about a month ago. We have been setting possum traps around the place. So far Tony Solomone has caught one possum and one feral cat (which were ruthlessly killed with a shanghai) and also one Novice. However, catching a Novice is not as bad as what someone did several years ago when they caught the Master of Novices in a trap by the hand! Robert Devlin is trying hard to catch a hawk but so far has only caught two hedgehogs, a rat and a blackbird. The Rabbitter called in and shot two rabbits, so at the moment we have two rabbits, one possum, one cat, two hedgehogs, a rat and a blackbird hanging on the fence! (We never bothered hanging the Novice up). Out bellman, Tim McCann, fell and hurt his knee so Tony O’Connor and Tim Donoghue have been acting bellmen. We now wake at 5.28 to the tune of “I love you because…”, “Mocking Bird Hill”, and other happy songs we all like to hear at 5.28 in the morning. Well, that is all the news.